A 7 day diet guide can help you to lose weight in a couple of different ways. The guide acts as a mental reminder of what your goal is and why you have that goal in the first place. The guide is going to help keep you on track from the very beginning of your weight lose journey. It will give you tolls and advice that you can use any time during your journey. 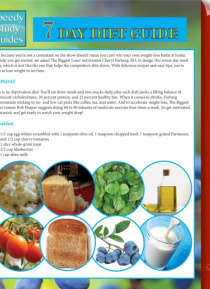 By using a 7 day weight lose guide, you… are starting yourself off with a little extra help. Who doesn't need that?